As hard weeks go here in Spain, this past week has been up there as one of the hardest. Never mind. We have found ways of getting over the frustrations that have dogged these last stages of our build project. Yesterday, having spent the morning scraping builders’ mess off our lovely tiled floors, our fabulous friend and neighbour in the village, Mari-Petra, invited us for lunch, guessing that we would neither have the time nor inclination to throw food around after our intense stint of manual labour. Mari-Petra is one of the loveliest people you are likely to encounter and has decided that, should the worst come to the worst apropos of Brexit then she would adopt Andrew as her son and I would get married to another of our favourite neighbours, Paqui. Sorted. Another diversion came our way the week before our first ‘deadline’ with the presence of Doodle. We had little to do that week, as we had cleared the decks ready for moving, so it was very easy to say “yes” when a friend asked us if we’d like to dogsit her dear little chap while she returned the UK for a week. Doodle is a real character. I am convinced there is a large percentage of Jack Russell in his makeup; he skips in the way that Jack Russells tend to skip, and his demeanour is simply that of a human being in dog’s fur. He certainly does not consider himself to be small! We had a great week with our huge companion. The weather was gorgeous (seems like a long time ago now) and we took some amazing walks off the normal tracks to explore rocks and pastures just as the wild flowers were beginning to show themselves. Doodle settled in remarkably quickly, although as he and his human used to live in Moclín, he must have felt he was in familiar surroundings. As the week drew to a close, we did plot various ways in which we might be able to keep him, such as not turning up to meet Caroline, Doodle’s pet, and pretending that we had never heard of her. Suffice to say, we did have to pack up his little bed, and his bowls and treats and take him home. The house seemed very empty without him. Fortunately, the day after we dropped off little Doodle, we had another little treat in store. We felt very honoured to be invited out on one of the village’s Cultural Trips. Many villages in Spain organise these excursions for their villagers, taking in historical sites, or visits to the coast or a city. Mari-Petra and Paqui suggested it and we thought, as we would not be moving in to our new house on that particular Saturday, a jolly jaunt might be just the tonic we needed. 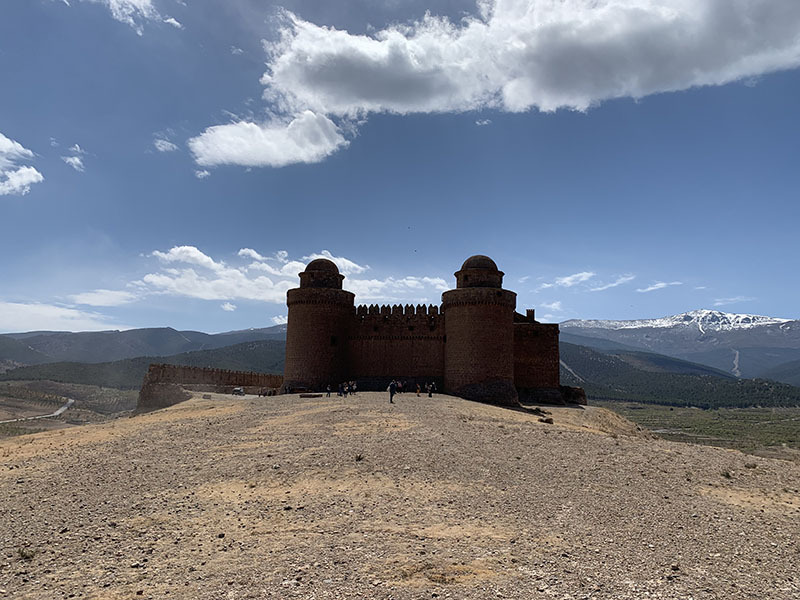 The coach trip, for villagers from Moclín and neighbouring Tózar, Olivares, Tiena and Puerto Lope, was to take us to the magical castle at La Calahorra, on the northern edge of the Sierra Nevada, beyond Guadix. Whenever we have driven up to Puerta de la Ragua, the pass that connects Guadix to the Alpujarras on the south side of the mountain range, we have seen this mysterious castle sitting on a hill set against the snow-capped mountains and it has always reminded us of something you might find in India. The castle used to be open to the public every Wednesday, but it is now no longer open at all, except by permission of the owners through the Diputación de Granada. We left Moclín at around 09:00 on a sunny, clear day and gathered up villagers en route before the hour-long drive to La Calahorra. A coach-load of Spanish people is an experience in itself. We were the only two non-Spanish people on the trip, and everyone was as welcoming as if we had known them for years. The decibel levels were quite high, as everyone talked to everyone else, with little let-up, but it was fascinating to be in the centre of this mobile community, and great for our Spanish. When we had previously passed through the village of La Calahorra, it seemed an uninviting place with little character, but when you wander through the streets that lead to the church, the square and then the castle, you realise that it is actually quite a pretty place with a great deal of history. We had a tour guide who met us in the village, and learned a great deal about the historical importance of the region, known as the Marquesado; a strategic stronghold during the time of the Mozarabes. Much of the development of the village and the castle itself, however, was carried out in the early 16th Century, following the Christian conquest of Andalucia. The castle was the first Spanish Renaissance building of its kind to be built outside Italy, perhaps no coincidence since one of the architects was Italian. The owner, Rodrigo Díaz de Vivar y Mendoza, was the first born son of the powerful Cardinal Pedro Gónzalez de Mendoza and, after the death of his first wife, Rodrigo went to Italy to study Italian architecture. On his return, he married Maria de Fonseca y Toledo, going against the wishes of Queen Isabel, and set about building this status symbol of a home. Designed to look like a fortress from the outside, and constructed on the site of a former Moorish fortress, the building is actually a palace, befitting one of the Spain’s most powerful noblemen of the time. Inside the solid walls, the Italian influence is in evidence at every turn. The central colonnaded courtyard is the heart of the building, off which lead carrara marble staircases and timbered galleries. The place is remarkably preserved, and as guests of the Granada Cultural team we were able to wander through rooms with heavily timbered ceilings, and glide around the cloisters. Part of the palace is closed off, as this is a private home and, unbelievably it belongs to a direct descendant of the first owner. It had, for many years, been left abandoned until, at the beginning of the 20th Century, it was almost sold and moved, brick by brick, the United States. Fortunately, it was bought by the current owners and kept where it belongs. Following the tour of the palace, we went to Ferreira for lunch. We have been to this village twice before, on our way back from Puerta de la Ragua, but had no idea that it, too, contained a few historic secrets. The Comarca de Marquesado was ruled by the Moors since their arrival in the 8th Century until they ere expelled some 700 years later. As a result, the prominent land masses in this otherwise flat area to the north of the majestic Sierra Nevada, were dotted with Mozarabe castles, and tucked away in one of Ferreira’s side streets sits what was once a Mozarabe farmhouse and small fort. This historic building was, until fairly recently, still used as a farm with space inside for the livestock. We had a fabulous lunch in Ferreira, chatting with our neighbours over a class or two of wine and a substantial meal. We then went for a stroll along another of Ferreira’s hidden secrets, el Paseo de los Castańos, a pathway meandering through an avenue of chestnut trees. A more bucolic corner of Andalucia would be hard to find. Before we returned home, we stopped in another very sleepy village, Dólar, where again, hidden away in the maze of little streets we found the beautifully preserved Baños Mozarabes, originally built as steam rooms in the 13th Century and latterly used as the village laundry. This is a strange corner of Granada Province, overlooked somewhat and a little neglected. At some stage, money has been spent to create a visitor centre at these baths, and similarly at the small castle in Ferreira, but we hardly imagine that tourists arrive in their droves to wander around these historic streets given that they are so little publicised. Without excursions for villagers, part-funded by the Diputación de Granada, we both feel that these amazing reminders of centuries gone by would simply crumble away into the surrounding agricultural dust. Visitors to the majesty of inland Spain have so many treasures to discover; treasures that are not on the main tourist trails and that need a little bit of pioneering spirit. However, dig just that little bit deeper and you can feel yourself transported back 700 years. For 10 minutes on the bus, there was a little bit of piece and quiet, as our companions had forty winks, but almost as soon as we passed Guadix the babble started again. These people are insuppressible, thank goodness. A day away with our friends, meeting new people from our area and uncovering more spectacular history in our corner of Spain was a much-needed diversion from the stress of house-build completion. 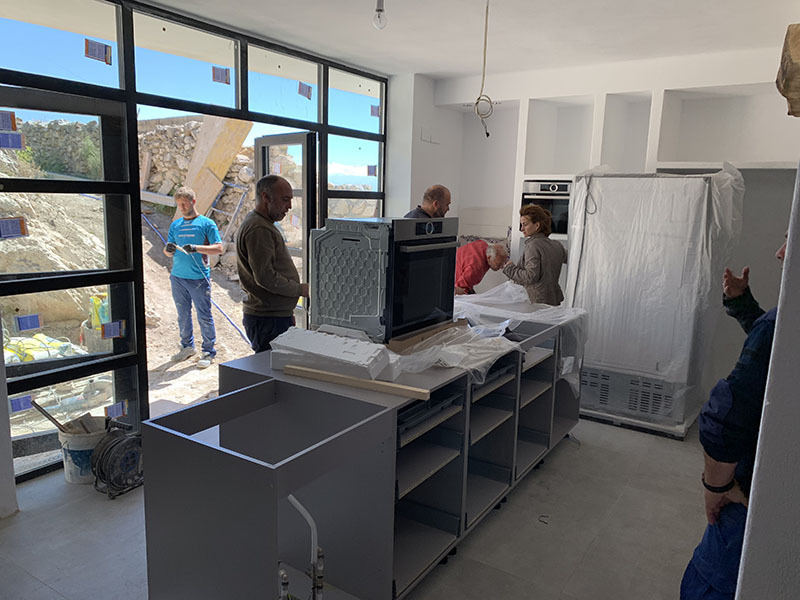 Tomorrow is Monday and the remainder that our kitchen is due to arrive, along with our mattresses and other final bits and pieces. I wonder if Rodrigo Díaz had such niggly problems when he built his stunning palace set against the magical backdrop of the Sierra Nevada?